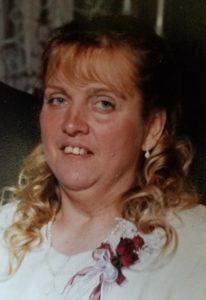 Roberta Louise Craig, daughter of Max W. Hudson and Dixie E. L. (Ahrens) Hudson was born April 23, 1961 at Belleville, Kansas and passed away on July 9, 2018 at her home in Munden, Kansas at the age of 57 years, 2 months and 16 days. Roberta attended Munden Grade school and Belleville High school. She was united in marriage to Lonnie D Craig on April 2, 1978 and to this union four children were born, Clayton, Amy, Nathan, Evan. She was a long time employee of Scott Specialties and a lifetime resident of Munden, KS. She was a member of the Booster Club and City Council, active in the church community of Munden Zion Evangelical and Republic Methodist Churchs. She is survived her husband, Lonnie D, Craig of Munden, KS, three sons, Clayton R. Craig of Munden, KS, Nathan (Jennifer) Craig of Munden, KS, Evan L. Craig of Riley, KS, one daughter, Amy E. Craig of Munden, KS, five grandchildren, Matayah, Khonor, Corban, Ava, Hudson, three brothers, James W. (Gayle) Hudson of Courtland, KS, Frederick A. (Sharon) Hudson of Aurora, CO, Albert L. (Judy) Hudson of Clifton, KS, two sisters, Rachel N. (Roger) Hoffmeyer of Deshler, NE, Brenda J. (Melvin) Keim of Tescott, KS, other relative and many friends. Funeral services will be held Ten AM, Friday, July 13, 2018, Zion Evangelical Church, Munden, KS, conducted by Pastor Roger Walls and Lance Rundus. Interment will be in Ida Cemetery, rural Munden, KS. Memorials may be given to Roberta Craig Memorial Fund. Friends may call on Thursday, July 12, 2018 from 1 PM to 8 PM at Bachelor-Surber Funeral Home, Belleville, KS, where the family will receive friends from 6 PM to 7 PM. Bachelor-Surber Funeral Home, Belleville, KS in charge of arrangements.